Taekwondo poomsae practitioner Kang Min-sung won South Korea's first gold medal at the 18th Asian Games on Sunday. Kang, 20, defeated Koorosh Bakhtiyar of Iran in the men's individual poomsae final to claim a gold medal at the Asian Games in Indonesia. This was also South Korea's second medal at Jakarta-Palembang 2018. Earlier, Yun Ji-hye took bronze in the women's individual poomsae. Poomsae, which requires taekwondo practitioners to demonstrate attacking and defense moves of the Korean martial art, is an official Asian Games medal discipline for the first time in Jakarta. At Jakarta Convention Center (JCC) Plenary Hall, Kang beat Soukthavy Panyasith of Laos in the round of 16 and Chew Wei Yan of Malaysia in the quarterfinals. He reached the final by edging Pongporn Suvittayarak of Thailand in the semifinal. 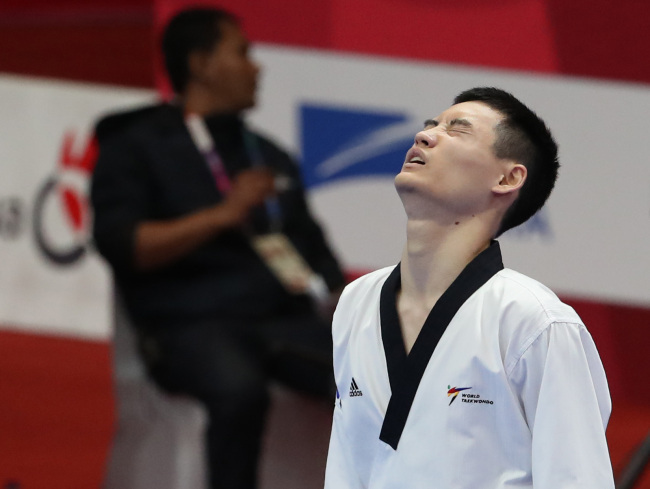 In the final, where the athletes have to perform two sets of poomsae -- one from recognized poomsae and another from new poomsae -- Kang earned 8.78 points by performing "pyongwon" poomsae in his first set, and collected 8.84 points from "nareusya" or "bigak 3" poomsae in his second set. Bakhtiyar received 8.7 points in his first set and 8.76 points in his second performance. For the poomsae competition, the average score of two poomsae sets determines the winner.